There were great results from Australian Biathlon student members in the XC events at the 2016 Australian University Snow Games at Mt Buller! 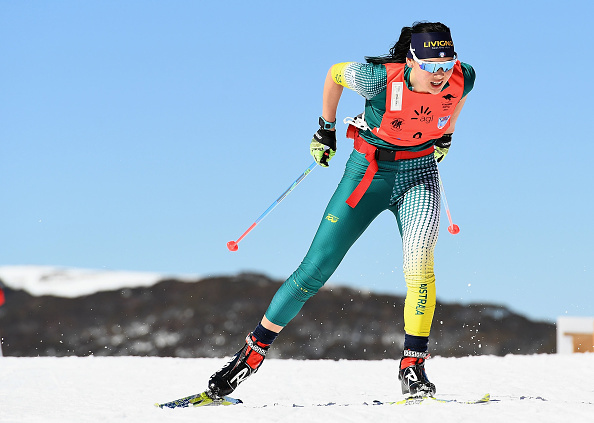 Best result was from Australian Biathlon 2016 Open Women Sprint Champion Jillian Colebourn (University of Sydney), who placed third in the XC Women Sprint. Most biathletes placed top 10 in their XC Sprint event, in fields which included World Cup and Continental Cup XC athletes. Last weekend the Target Rifle Victoria Championships were held at Melbourne International Shooting Club. A dozen Australian Biathlon members either participated or came to support and watch the competition. The best result by a biathlete was Russell Croser, who finished with 577.024, placing tenth in Victoria. Close behind was Emma Croser, who was very pleased with 576.019, a personal best. Best Junior score was earned by Jethro Mahon, fresh from his 2016 Winter Youth Olympic Games experience at Lillehammer, NOR. Several biathletes are members of Melbourne International Shooting Club, which is a regular venue for biathlon training. In 2014, former World Cup athlete Michael Lillycrapp, with assistance from coaches Barry Field, Paul Connor and Toscha Stopar, organised and ran Summer Biathlon events at METEC Driver Training Centre at Bayswater, Melbourne. These events were so successful, they are being repeated in 2015. Biathletes aged from six and up are welcome to take part in the various events, which may be Mass Start, Super Sprint Relay and Individual Time Trial. It will be huge fun for all participants, be they first timers/current international athletes/weekend warriors/Masters athletes. You can get around the track by rollerskiing, Skiking, scootering or running. Australian Biathlon coach Bob Cranage OAM, assisted by Neil Burbidge, ran the final “on snow” laser biathlon session for 2014 at Falls Creek, after the Snow Trek and Travel Miniseries cross country race recently. Over thirty kids took part in the biathlon event, which included relays. A biathlon course was set up in the Nordic Bowl area of Falls Creek. This area will be very familiar to those who have taken part in the Australian Hoppet Weekend, which is part of the famous World Loppet Series of cross country races. The laser event was huge fun, a huge success, to be repeated in 2015! Today the 2014 Australian Winter University Games XC events were held at Mt Buller, VIC. Athletes from a dozen different tertiary institutions took part in the Individual and Relay races. Six biathletes took part. Some racers today were Uniroos at the last Winter Universiade (University Games) at Trentino, Italy. Others are hoping to attend the next Winter Universiade in XC/biathlon at Strbske Pleso/Osrblie, Slovakia next January/February. Conditions were typical Australian Spring skiing – warm and sunny, with softening snow. The Men Individual Race was won by Australian XC Team member and 2014 Olympian Phil Bellingham (Charles Sturt Uni) with AUS XC Team member Nick Montgomery (Melbourne Uni) second and Mark Pollock (NSW Uni) third. Biathletes competing in this event included Grigorii Kazantcev (RMIT) fourth, Jeremy Flanagan (Melbourne Uni) fifth, Alex Gibson (Aust Catholic Uni) sixth, Hamish McLean (Monash Uni) eighth. Robbie Catto-Smith (RMIT) was unable to finish his race. The Women Individual was won by AUS XC Team member Casey Wright (Victoria Uni), with fellow team member Ashleigh Spittle (Monash Uni) second. In third place was biathlete Jillian Colebourn (Sydney Uni). In the Men Relay, it was a fight to the finish, with Melbourne Uni beaten by 1.66 seconds, by winner NSW Uni, with Monash Uni rounding out the podium. In the Women Relay, podium finishes were reversed, with Monash Uni taking first place honours, followed by Melbourne Uni, and NSW Uni in third place. Australia has been represented at seven Winter Olympic Games, since the first Australian biathlete, Andrew Paul, participated in 1984. Pictured is Alex Almoukov, currently Australia’s only World Cup biathlete, at Vancouver 2010.